LONDON -- A shift in how Europeans finance their cars is threatening to expose bondholders in the region to the same risk that's been building in the U.S. for decades. Buyers of notes backed by auto debt are increasingly vulnerable to drops in used-vehicle prices because more and more drivers in Europe are leasing cars and trading them in for new ones. The U.S. is already dominated by leasing contracts, which consist of low monthly payments for several years followed by a large lump sum or return of the car, unlike traditional loans of equal installments. The shift in Europe reflects broader changes in consumer attitudes about buying everything from mobile phones to entertainment, said Adrian Dally, head of motor finance at the Finance & Leasing Association. Motorists like leasing because they can drive more expensive cars and upgrade more regularly. Manufacturers like that it fosters customer loyalty and spurs greater turnover. 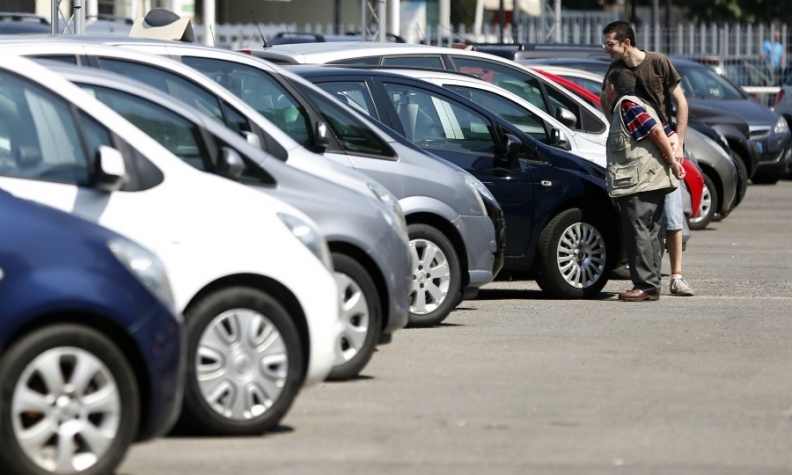 "If there's a steeper decline in car values, then borrowers will be incentivized to return their vehicles and it will be bondholders who bear any losses," said Aaron Baker, a London-based credit analyst at Banco Bilbao Vizcaya Argentaria. "This exposure to used-car prices could be catastrophic." While residual values have been securitized in the U.S. since at least the 1990s, Europe is now catching up. The number of transactions backed by residual values in the region rose to 14 in 2016 from just one in 2009, according to UniCredit. Almost 80 percent of the 6.2 billion euros ($7.1 billion) of auto-debt securitizations sold in Europe this year included cash flows from residual car values, up from 47 percent in 2012, according to data compiled by JPMorgan Chase & Co. In the UK deal, exposure last year rose to as much as 55 percent from less than 20 percent in 2015, UniCredit data show. The trend toward securitizing residual car values is also being fueled by a rapid expansion of consumer credit. More than 85 percent of new cars in the UK are now financed, up from just over half in 2009, according to data from the FLA trade group. Most of that debt consists of so-called personal contract purchase agreements, which are similar to short-term leases and encourage buyers to return cars at the end of the contract. That's putting downward pressure on second-hand car prices, according to Moody's Investors Service. It's also increasing household borrowing, making automakers and consumers more vulnerable to any increase in interest rates. "There's no guarantee that actual residual value cash flows will match the expectation," Moody's warned in its rating of a Volkswagen Group deal in March. VW sold 368.5 million pounds ($479 million) of bonds backed by UK auto lease agreements, with about half of the cash flows coming from residual values stipulated at the beginning of the contracts. Late last year, such cash flows made up about 60 percent of BMW Group's 452 million-euro securitization of French auto leases and of Societe Generale's transaction secured by German collateral. "Leasing-style agreements such as PCP create churn and increase the supply of used cars," said Anthony Parry, a senior vice president in the structured finance group at Moody's in London. "The growth in lease-style agreements means a decline in residual values is in the post for Europe." To be sure, investors are willing to take the risk for the right price. Low interest rates in Europe and extra protections in some deals can make the notes appealing, said Matthias Wildhaber, a Zurich-based money manager at GAM, which oversees 126.9 billion Swiss francs ($132 billion). Calvin Davies, the Hague-based head of ABS and covered bonds at NN Investment Partners, which oversees 194 billion euros, said he's being selective with residual-value deals rather than avoiding them entirely. He prefers transactions in Europe that are backed by prime quality collateral. "If it's properly priced and calculated I would be happy to take the risk," Wildhaber said. "Because of strong demand from end investors for higher-yielding bonds, it's likely easier to place this risk than it used to be." Compensation, though, is falling. The average extra yield senior-ranking notes of auto securitizations offer compared with benchmark rates in Europe fell to a 10-year low of 15 basis points this month, JPMorgan data show. The average yield premium for European securities backed by mortgages and credit card debt is 46 basis points, according to Bloomberg Barclays index data. "Investors only used to be exposed to the resale value of a car if a borrower defaulted, but now they're also exposed if a borrower elects to give back the car at the end of the lease," said BBVA's Baker. "If there's a difference between the depreciation stated in the lease contract and the real price decline, that'll be written off and bond investors will take the hit."